Home » Bottles: 2001 - Newer » Item Details: TOPPLING GOLIATH CHAINSMOKER 22 oz. bomber (RARE)! TOPPLING GOLIATH CHAINSMOKER 22 oz. bomber (RARE)! 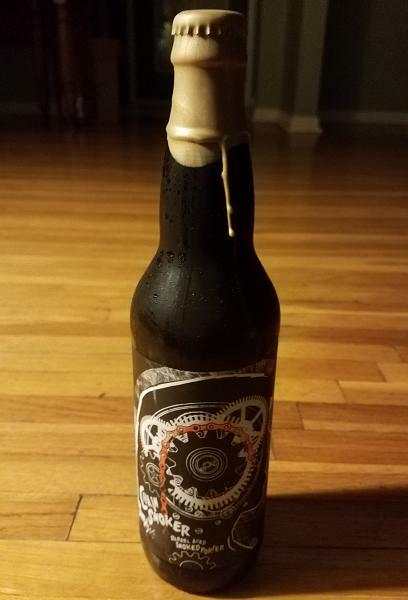 Rare Smoked Imperial Porter brewed in collaboration with Florida's Cycle Brewing. Will never be brewed again... a rare whale. This porter is only a few years old and is ageing well. It has been stored in the city of its origin since 2016. Porters like this can age for a decade or more before they mature. A very limited number of these collectible bottles still exist. Frankly, It is the unicorn of beers... it is so good that everybody drank their bottle! But not BeerBrothers! We have just a few left in the cellar we are willing to share! 13.7% ABV. 20 IBUs. "Tan head. Dark brown black color.Aroma: vanilla maple and bourbon. So sweet. Toffee and caramel. Amazing. Taste: chocolate, fudge, and bourbon. Oak and vanilla. Toffee. Caramel. Very minimal smoke. This is more of a stout than anything. Is there any smoke here? Nice warming bourbon. Incredible.Full bodied. Thick and warming. This beer is incredible. It's a stout with little to no smoke... definitely worth a try." "L: Almost black S: Oaky and slightly smokey T: subtle smoke, oak, chocolate, slight vanilla F: Thinner than other BA TG brews. However, this is a porter and not a Stout. That is my only knock. O: Amazing beer. Best smoked porter I have ever had."